It is hard to believe that the year is half over and I’m already looking ahead to my continuing education plans for 2019. 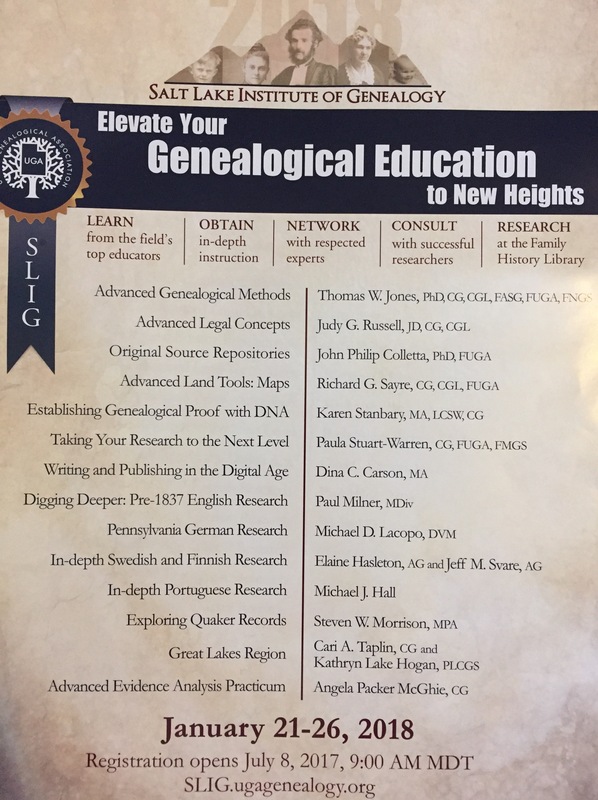 In a little over a month, I will be attending the July week of the Genealogical Research Institute of Pittsburgh (GRIP) in Pittsburgh (as opposed to the July week in Amherst, NY) coming up soon, taking the course “Women and Children First” with Judy Russell. Looking ahead to future educational opportunities, I want to point out that GRIP’s 2019 courses have been announced and you can read about them on their blog. Two weeks will be held in Pittsburgh at La Roche College, which is a lovely and inviting setting for a week of study. The weeks are June 23-28 and July 14-19, 2019. Mark your calendars! GRIP is one of my favorites. I hope to see you there! Take advantage of these excellent educational opportunities and potential funding sources! I’ve been in Grand Rapids, Michigan since Tuesday when I attended the Board for Certification of Genealogists (BCG) Education Fund’s “Putting Skills to Work” class. What an excellent day! The time was split between two classes. Connie Lenzen’s class “Planning and Executing Reasonably Exhaustive Research: Or How to Ensure a Successful Hunt” discussed research questions and plans. I have to say that I was quickly reminded of what I should be doing everyday. I get so excited for the research that I forget to focus, slow down, and set forth a path for my search. Tom Jones made us think about “Citing All Kinds of Online Sources.” This class focused only on sources you find online and really made us look at all of the layers that an online source might have. The original source, the microfilmed version, the scan of the microfilm, an original digitization in color, previously published or not, and so on. We worked through many example citations as a class and discussed each of the parts. The level of interactive instruction that one gets at a BCG “Putting Skills to Work” class is incredible. If you are interested in certification, are already on the clock, or are already certified, it doesn’t matter. These classes are wonderful examples of hands-on, lecture with discussion with exercises, types of classes many of us enjoy and will benefit for our own continuing education. For more information on the BCG Education Fund, visit bcgedfund.org. On the topic of Irish research, this opportunity slid across my news feed recently: the Irish Genealogy Virtual Conference. You can read more about it here. The website states: The virtual conference starts at 9 am (Eastern) with presentations being delivered in pre-recorded webinar format. Presentations are made available in sequence. After one presentation ends, another becomes available. Also, the webinars are available for 72 hours to accommodate time zone differences. The National Genealogical Society’s Annual Conference is coming right up! I am honored to be going to present three lectures among a wide variety of very talented speakers. The conference is being held in Grand Rapids, Michigan from 2-5 May 2018. If you are unable to attend in person, NGS just announced their live stream schedule option. You can read the full release with sign-up instructions and fees here. Details about the live stream program, plus additional conference recordings, can be found on the PlaybackNGS Website. If you’d like to attend, but can’t make it in person, this is a wonderful opportunity to attend from home. The summer is fast approaching! It seems like Christmas was not that long ago. (Don’t tell anyone but I still have a string of Christmas lights hanging on our banister.) Since April is already here, I thought I’d take a moment and share my Summer and Fall travel and speaking schedule with you. Exciting things are on my horizon and I hope to see some of you at one of these events! April 27 – I will be traveling to the Clayton Library with other area genealogists on a bus trip. April 30 – I am excited to attend a seminar featuring Dr. Michael Lacopo at the Kendall County (TX) Genealogical Society. May 7 – 15, my spouse and I will be taking a trip to Salt Lake City for nothing but research, research, research! May 21 – I will be attending the Austin Genealogical Society Annual Seminar featuring Thomas MacEntee. June 2-5 – I will be attending the Southern California Genealogy Jamboree, and will be presenting on Sunday. June 15-25 – I will be on a family vacation to Detroit Lakes, MN with a few genealogy stops tucked in somewhere along the way. 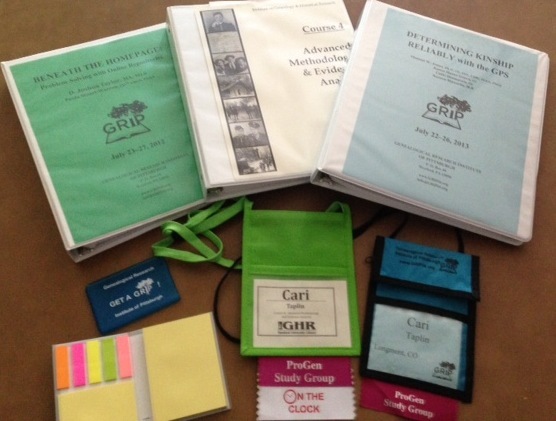 June 26- July 2 – I will be attending GRIP and taking the Forensic Genealogy course. July 17 – 22 – This year I am lucky enough to attend both weeks of GRIP. The second time, I am taking the Practical Genetic Genealogy course. August 31-September 3 – I am attending the FGS Annual Conference in Springfield, IL. September 17 – I will be presenting an all-day seminar in Hot Springs Village, Arkansas for the Village Genealogical Society. October 9 – 14 – I will be one of the lecturers in the course “Crossing the Pond” coordinated by Eric Stroschein at the British Institute sponsored by ISBGF in Salt Lake City. October 28 – 30 – Texas State Genealogical Society Annual Conference is in Dallas, TX. November 11-13 – I am considering attending the FamilyTree DNA Conference in Houston, but we will see what my budget and energy will allow by then. After writing up this list, this one may have to wait until next time. November 17 – I will be speaking at the Sun City (TX) Genealogy meeting. Wow! I’m exhausted just writing this up! Well, that’s what’s in store for me for the rest of the year. I’ve got other projects underway as well. So, if you find yourself near me at any of these events, be sure to say ‘hi’! One of the most frequent questions I get through my website relates to how I “became” a professional. What educational steps did I take? When did I feel “ready” to take the step beyond being a hobbyist and into the realm of being a professional? I’m always more than happy to offer a few suggestions from my experiences on this path. My path is going to look different than your path, of course. But these are just some of the things I’ve learned along the way and am sharing so that perhaps you can take one less step than I took to get here. Before you decide to take the plunge, you will need to determine how much time and money have to devote to the educational process. If yours is the main income for your family or situation, your path is going to look a lot different from someone who has the luxury of having a spouse whose income can take care of the family needs. And of course these are two points on the spectrum and everyone’s situation is going to be unique. Examining your time and financial situation will determine which courses, programs, classes, institutes and so on you might consider in the future. If you want a “fast track” I would look at something like the Boston University program in genealogy or the National Institute of Genealogical Studies where you can earn a PLCGS (Professional Learning Certificate in Genealogical Studies). They have higher price tags up front, but I’ll bet that if I tallied up all of the money I’ve spent on the educational events I have done, their price is probably comparable if not less expensive. My educational funds were spent in smaller increments over many years. Taking a more condensed course like those above will require a larger upfront commitment. These online courses were not available when I got started. 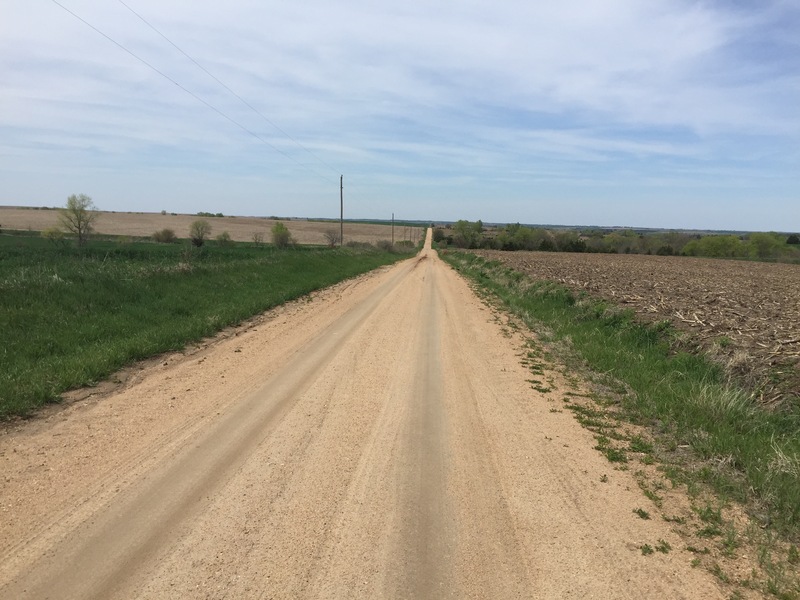 I took a longer, slower road, finding educational opportunities when and where it was convenient. The whole paradigm of online education was not available to me yet and all of these great webinars that are not online… Woah! And even though I have crossed some imaginary line and have “become” a professional, I still partake of any online class, webinar, and study group I can fit into my schedule. A professional never stops learning and should never be so arrogant to think that they can’t learn something new everyday. In addition to this I recommend attending every weekend seminar, online webinar, local genealogical society meeting, and any other online or in person study group you can fit in your schedule and budget. Read anything you can on the topic. There is no shortage of reading material when it comes to genealogical study. I have a steady stream of blogs, journals and books that pile up on my desk. I recently saw a quote by Earl Nightingale that claimed if you read one hour per day in your chosen field, you will be an international expert in 5 years. I don’t know if that is true but it makes sense. The more you read the more you learn, boost your analytical thinking, and improve your memory (or so says the internet). I know that if I didn’t read NGSQ articles, I would lack understanding of how to analyze my research findings and how to present it in a coherent proof argument. Probably the biggest thing that happened to me that caused me to “become” a professional was that nudge from my mentor, nationally known and well-loved Birdie Holsclaw, who told me I could be and I should be doing more with my genealogy. Having someone of that caliber believe in you really is a confidence booster. So, I try to pass those messages on to others in Birdie’s honor: You can do more, you do have something valuable to share, and you can make a difference in someone’s career. It is difficult to find a mentor, I have found that mentoring just kind of happens. But you can leave yourself open to it happening. Volunteer at your local or state society, attend local events, forge genealogical friendships, don’t be shy, and allow yourself to be available to a mentor. The imaginary line I referred to above, is really just a mental decision that my work was going to meet a higher standard than it had been at before. I would put citations on everything. I would follow the Genealogical Proof Standard. I would adhere to the standards set forth by my colleagues in regard to professionalism in my work, behavior, online presence, writing, and so on. It had nothing to do with taking clients, making money, getting the post nominals, or landing a national speaking gig. It was a mental decision. That’s when I “became” a professional. I hope these little bits of information help you with your path to becoming a professional. Realize that your journey is different and if even one of these thoughts helps you find your path, then it was worth it. I recently had a reader ask me how I got started, more specifically, where I took my first genealogy class. So here is a quick summary of my genealogical education. I have always enjoyed research. In college I was an art major and spent a semester as a research assistant for my art history professor. It was a blast. Also, I was one of those weird kids who was delighted every time a research paper was assigned in class. I love being in libraries and archives and this is probably one of the aspects of genealogy that drew me in. A genealogical society usually offers lectures, classes, regional conferences and other people with experience from whom you can ask questions and grow as a genealogist. At the society I attended, I learned about genealogical methods, records, and other topics as well as about conferences and classes I could attend. Shortly after this I attended my first national conference in 2003. A national conference has the benefit of having a lot of lectures to choose from on a large variety of topics. You can also meet other people who are also researching their family history and begin a wider network of genealogists. As for actual classes, I attended any regional conference that came my way. I begin in the Denver-metro area and there were many active genealogical societies who brought in a lot of high-caliber genealogists. I also began attending week-long institutes that focus on one topic for an entire week. And now I have found many online opportunities such as free or for-pay webinars that I enjoy attending in my sweat-pants and slippers in the comfort of my own home. I wrote a series of blog posts about these institutes which can be read here. So in a nutshell, that’s how I got started … and kept going … and am still doing. I enjoy all aspects of genealogy from the research to teaching to attending classes to writing.